The Economic and Financial Crimes Commission on Thursday sealed off some properties allegedly belonging to the immediate past Governor of Ekiti State, Mr Ayodele Fayose, in Ado Ekiti, the state capital. 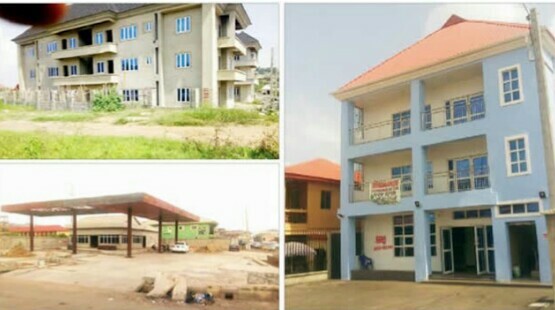 The buildings include a block of two-storey commercial complex located opposite the Ekiti State Local Government Service Commission; the NTS Event Hall and Hotel, Fajuyi; Our Peoples 104.1FM, Fajuyi; and a building beside Spotless Hotel, GRA, Ado Ekiti. Others are a twin-building behind the Government House at the GRA; a two-storey commercial building at the Okesa Market; and a petrol filling station, whose land the Muslim community had on Sunday alleged was taken away from them. The Punch reports that the sealed buildings were not less than 12. The trial of Fayose for alleged theft and money laundering began at a Federal High Court in Lagos on Monday. The EFCC alleged that the former governor benefited to the tune of N2.99bn from the arms fund allotted to the office of the former National Security Adviser, Col. Sambo Dasuki (retd). The former governor was accused of collecting the amount to finance his re-election as governor in 2014. The Station Manager of Our Peoples 104.1FM, Layi Oyawa, who noted that the station was not sealed but placed under investigation, said the organisation was being run by Ejemu Nigeria Limited. “You can see, we are on air. The EFCC came here this morning that this place was under investigation. They are free to investigate,” he stated. But Fayose accused the EFCC of going about sealing houses belonging to innocent people in the state under the guise that they were linked to him. The former governor, in a statement by his media aide, Lere Olayinka, stated that he was informing the public ahead of the EFCC’s usual blackmail and media trial. 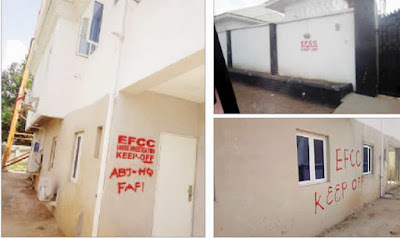 The statement read in part, “Just being informed that operatives of the EFCC, in collaboration with the All Progressives Congress government in Ekiti State, are going about sealing houses of innocent people in the state under the guise that the houses are linked to me. “This is another wild goose chase and the usual media campaign against my person. It is only in our country that an anti-corruption agency will first go about sealing houses before determining the ownership, which can be done so easily by visiting relevant agencies. “I am therefore informing the public ahead of their usual blackmail and media trial. None of the properties in question is owned by me and the records are there for anyone that is interested to see.